Cognitive impairment following stroke is predominantly related to the region of destroyed brain tissue, the capacity for accommodating the loss of function that results, and the degree of recovery. However, some of the variance in cognitive function after stroke is related to the mechanism of stroke. Most strokes result from brain ischemia, but up to 15 % may be due to subarachnoid (see Chap. 10) or intracerebral hemorrhage (ICH). Among the strokes resulting from brain ischemia, most are caused by hypertensive arterial disease, atherosclerotic disease, or cardiac disease. However, a minority may be caused by a wide range of less common arterial or hematologic diseases, including vasculitis, hypercoagulable states, and others. 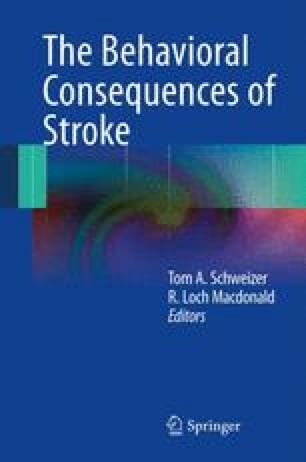 In some cases, these diseases may have their own effects on cognitive function independent of the presence of stroke, with their own tempo and characteristics. Here, we review the associations between cognitive function and ICH, and cognitive function and less common causes of ischemic stroke.